Rollators available with heavy duty casters for indoor and outdoor use. Push down lock operates easily and ensures safety. 6" casters with soft-grip tires are ideal for indoor and outdoor use. Tool Free removable padded backrest for comfort. Comes with standard carry pouch under the seat for added privacy and security of personal items. Handles are adjustable in height. Easy, one hand folding. Dimensions: 25" x 34" x 25"
Removable, hinged, padded backrest can be folded up or down. 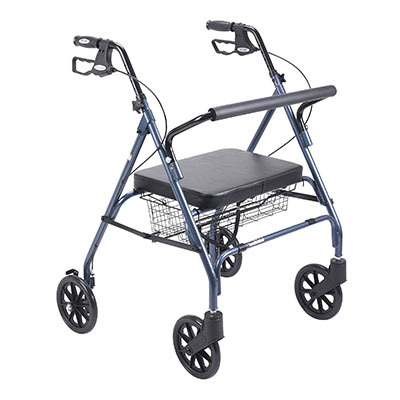 6" Black non-marring casters with soft grip tires are ideal for indoor and outdoor use. Comes with standard carry pouch under the seat for added privacy and security of personal items. Easy to use deluxe loop locks. Serrated brakes. 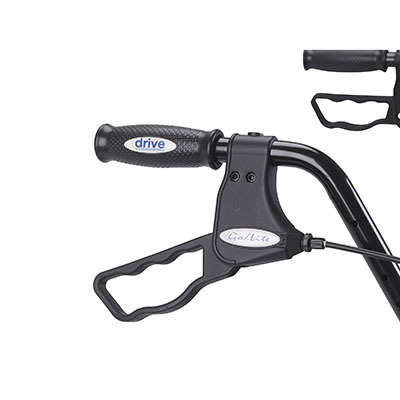 Ergonomic handles are easy to grip and are adjustable in height. 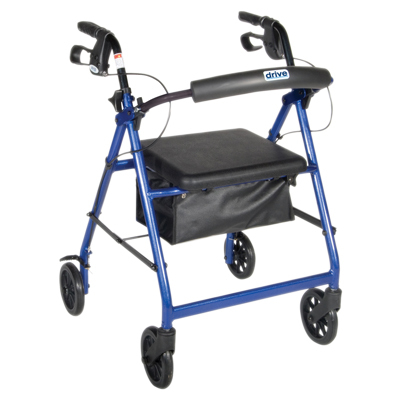 Dimensions: 25" x 31" x 25"
The Heavy Duty Bariatric Walker Rollator with Large Padded Seat comes in an attractive blue finish. It is constructed from a strong, steel reinforced frame that supports up to 500 lbs. and comes standard with a large, comfortable, soft padded, oversized seat with a large basket that is mounted underneath. The basket easily and securely transports personal items. The large, 8" caster wheels are ideal for indoor and outdoor use ensuring a smooth ride over most surfaces. 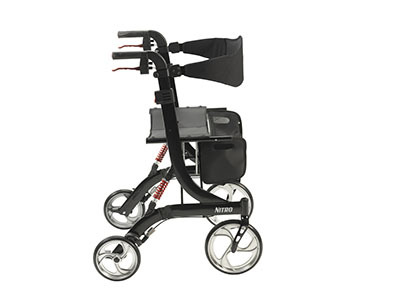 Dimensions: 26.75" x 35.25" x 30.5"
The Nitro Euro Style Walker Rollator is a safe and convenient aid for improving your daily mobility. 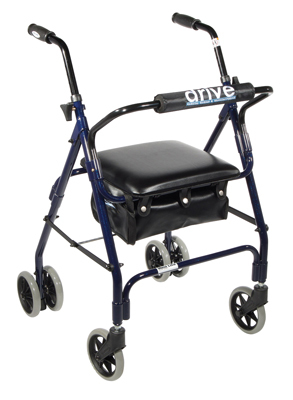 The wheels make the Rollator a superior option over a standard walker, eliminating the need to lift the device and allowing you to walk with an easy, smooth gait. The unique suspension system allows for easier traveling over uneven, outdoor terrain, making them great for your active, busy lifestyle. 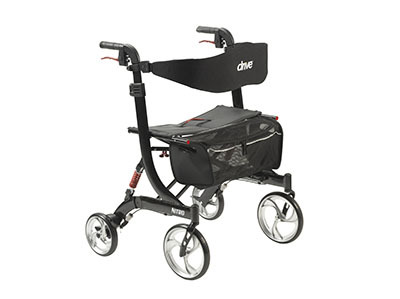 With a wider built-in seat found on the Rollator, you'll always have a convenient place to rest. Featuring an eye-catching style, the Nitro's caster fork design allows for an enhanced turning radius while the 10" front casters allow for optimal steering and rolling comfort. 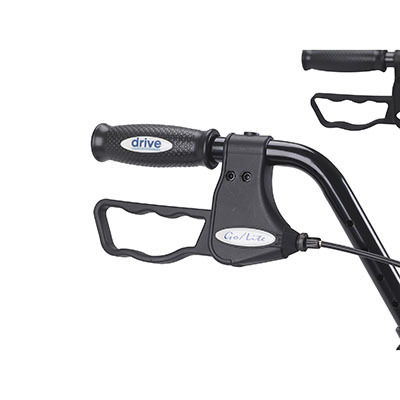 In addition, the Nitro locates brake cables within the unit's black frame for safety and offers a quick and easy tool-free adjustment to the handle height and back support. 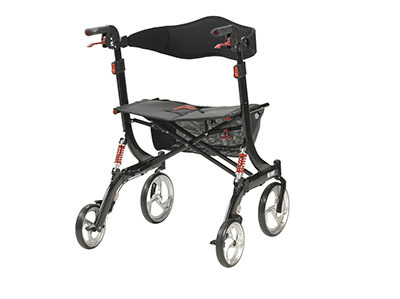 The Nitro provides easy mobility for users up to 450 lbs. and easily folds with one hand to an ultra-compact size for storage. Dimensions: 28" x 36" x 28.25"
Weight Capacity: 450 lbs lbs.